Guthrie, of Scotch-Irish heritage, began his life in Okehmah, Oklahoma in 1912 and died in Queens in 1967 after spending the last years of his life hospitalized with Huntington’s disease, a fatal genetic disorder in which the brain’s nerve cells break down over time. 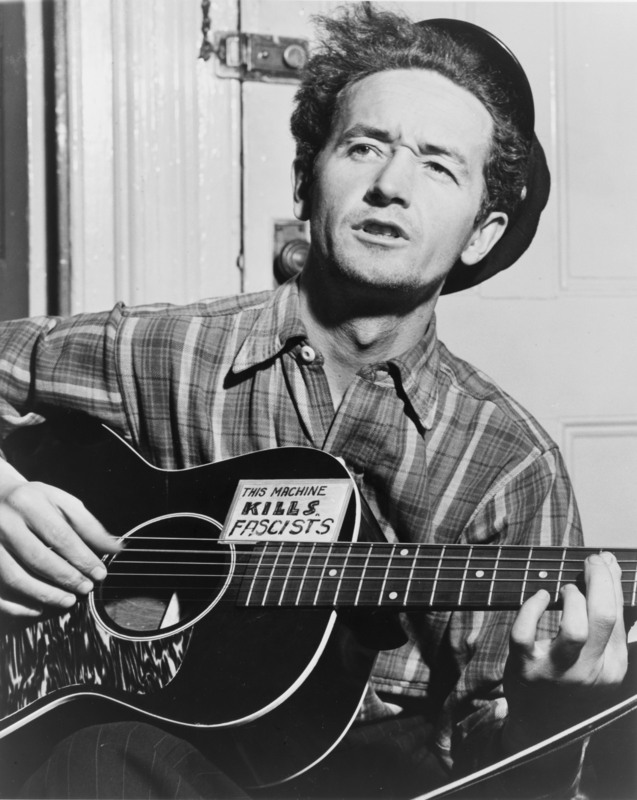 His was a life of turbulence and tragedy (his mother also died of Huntington’s), but he left us with a greatly enriched American songbook – “This Land Is Your Land,” “So Long, It’s Been Good to Know You,” “This Train Is Bound for Glory,” “Union Maid,” and “Deportee,” being among his many compositions. The production has been traveling the world since it began its theatrical life at the Edinburgh Fringe Festival in 2007. In addition to the U.K., the show has toured throughout Europe, and has been performed in China, the Middle East, and across the U.S. There are also talks of bringing Woody Sez to Ireland after its run at the Rep.
Lutken, a life-long musician, was encouraged to work on a theatrical presentation of Guthrie’s life by Harold Leventhal, who had been Guthrie’s manager. “Mr. Leventhal thought it was important to present Woody’s life in a theatrical format. There would be a depth of meaning for the music knowing Woody’s life story,” Lutken said, adding that he considers himself a “deviser” because most of the material for the show is based on direct quotes from Guthrie. After years of immersing himself in all things Woody, Lutken’s performance fits Woody’s character like a glove. His performance is skillfully crafted and wonderfully acted, and he has won the Helen Hayes Award and the Joseph Jefferson Award for best actor for the role. Lutken is also pleased that audience members have been sharing their Woody-related memories with him when he comes into the Irish Rep lobby after the show. A special bonus of the New York City staging is that folk performers like Judy Collins, who was influenced by Guthrie in New York in the 1960s, have been in to see the show. Lutkens’s commitment to the Guthrie legacy also includes the donation of a portion of the profits from the sale of the cast-recording album to the Huntington Disease Society of America. Correspondent with the musical, the Irish Rep has also dedicated its second floor to a museum-quality exhibition of Guthrie’s life and times. It’s definitely worth the trip upstairs, which the audience is encouraged to do during intermission.